Love the juxtaposition of big diver, little girl. Makita drilled over 20,000 holes to create one large image. 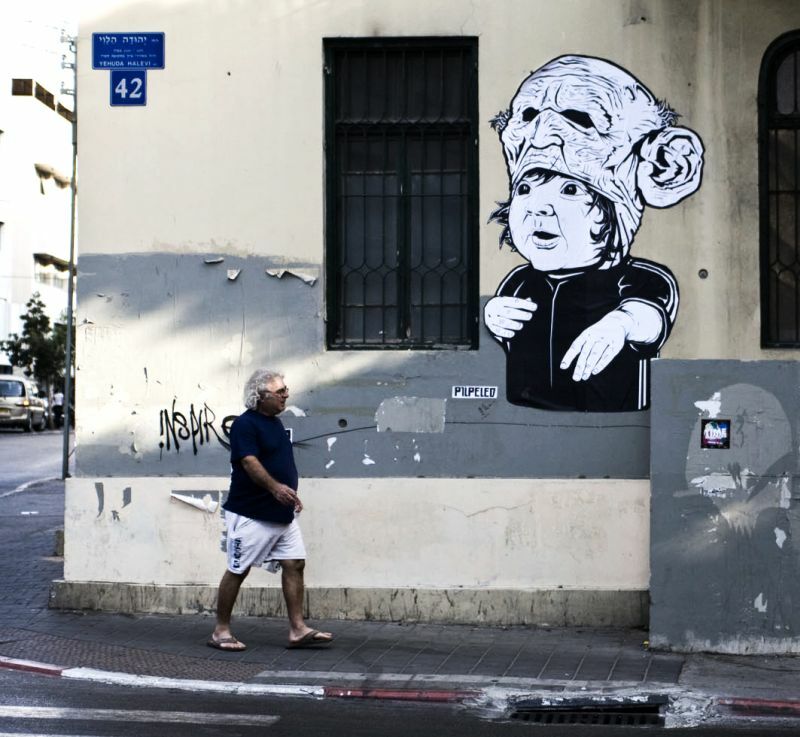 No explanation of this Tel Aviv wall art from Pilpeled, but I dig it anyway. More from the artist is here. I just found a gem in Bridge, that I did not know…go figure.. I was getting so frustrated with bride so see the whole image (that is large) before I put into RAW. Well, numb nuts found if hit the space bar,the photo would enlarge, then if I touched the photo with my cursor, it got bigger, then take the space and mouse and move it around….Bridge makes more sense than ever. I guess I am one of those macho wimps who would rather build a Lego set than read instructions. Don’t know who to ask to find this out, so I’m hoping you can do me a fave and point me in the right direction. I’m trying to use the extension manager to package up my scripts for use in Photoshop. This works fine in CS4, but borks in CS3…on mack it crashed out the EM and on PC it thinks it’s a Dreamweaver plugin. Does the extension manager for CS3 support extensions for photoshop? I just found a neat trick in PS4. I did a shoot yesterday of model. For effect I took curves and lower 75%, then took brush and created lights (not big deal here) what if found out, I could transform the “light beams” and “stretch out” lights” for effect. To add more light, repeat on new layer, add another mask to first layer and all over all again,,new lights and angles. I sure you guys new this…but I have a hard time adding a creative light with out spending a lot of time….This is done in aout 4 mins. That Makita drill ad is pretty awesome. However, it’s also pretty awesome that they have a picture of a *non*-Makita drill being used to make the ad!